The John T Reid Charitable Trusts are a national funding organisation with a wide ranging commitment to philanthropy around Australia. The Trustees are proud of a track record of generous giving for sixty years, being responsive to community need and supportive to key issues. We believe that good philanthropy results from developing relationships with people. Trustees play an important role in meeting with applicants to determine the full extent of the project for funding. This hands-on approach enables practical, creative and responsive giving. We wish to advise that after 17 years of working with the John T Reid Charitable Trusts, Debbie Ashbolt has tendered her resignation as CEO. Debbie is taking a well-earned career break, and we wish her well in her future endeavours. Debbie has played a key role in moving the Trusts forward to where we are today, and we thank her for the commitment she has shown to the John T Reid Charitable Trusts over so many years. We are now closed for funding enquiries. Our next enquiry round will be open in June 2019. Please check the website closer to June for specific dates. 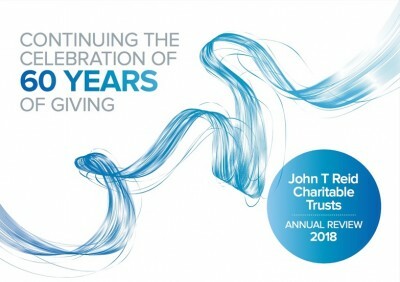 The Trustees of the John T Reid Charitable Trusts are delighted to provide you with our 2018 Annual Review, which summarises our philanthropic activities for the year and highlights more of our 60th Anniversary grants awarded in celebration of our first grant in 1957. The report also highlights several significant projects funded in our six different categories of Aged and Palliative Care, Arts and Cultural Heritage, Community and Social Welfare, Education and Youth, Environment, and Health Support. Thank you to Konker Creative for the design and support creating our 2018 Continuing the Celebration 60th Anniversary Annual Review.